Okay I’m going to let you in on a little secret. My boyfriend and I are a bit of Disney fanatics. We were lucky to visit Disneyland for Halloween this year and we surely got bite by the Disney bug! We very strongly considered heading down to Disney World for Christmas because it would so merry and magical and well… #TeamDisneyWorld. But we didn’t end up going through with those plans because celebrating Christmas just wouldn’t be the same without our two dogs. Instead we’re headed back to LA to spend the holidays with our dogs and my boyfriend’s family. We’re even planning to make to explore a few places that we’ve never been (like Utah!) when we make the drive from Colorado to California. And yes, the dogs are coming with. Maybe I can even get them to pack lighter this trip. Sheesh. How many bags to they need?! So even though I had a minor blip in my sanity (hey, it’s been a rough year! ), I’m thrilled to be bringing Ralph & Luna along for holiday travel. 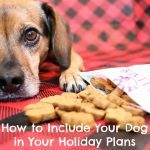 I also love pet brands who know and realize that pet parents want to include their dogs and cats in the holiday festivities by offering seasonal treats, toys, and more. 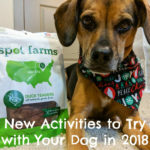 When heard wind that one of our favorite pet food and treat brands, Wellness, was releasing some seasonal treats, I just knew my two pups would have to give them a try. Not only do these treats come in super cute shapes, but they are also a tasty Gingerbread recipe. Ralph & Luna can’t get enough! 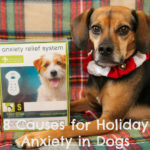 Lucky for your pup, Wellness has agreed to sponsor Day 9 of the 2017 Stocking Stuffer Giveaways. 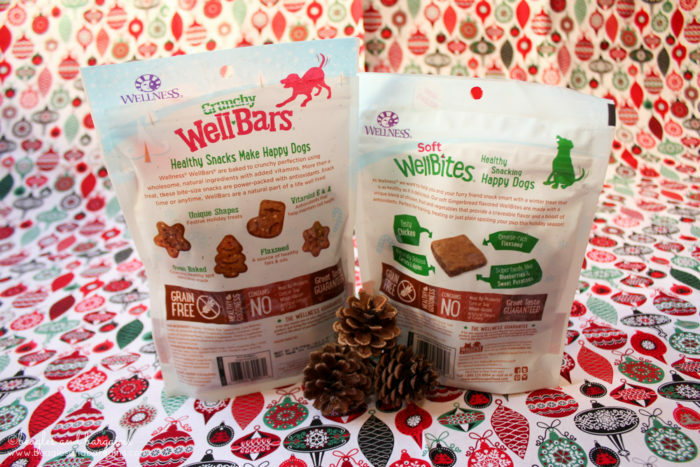 We’re giving away a few bags of Wellness Gingerbread Crunchy WellBars and Gingerbread Soft WellBites, so keep on reading to see how to enter! One of my favorite traditions with my family is to bake and decorate Christmas cookies. In my family, we make all kinds of cookies – Sugar, Gingerbread, Chocolate chip, Mexican (or Russian or Wedding) Tea Cakes, and then usually something new. Dogs can be included too! 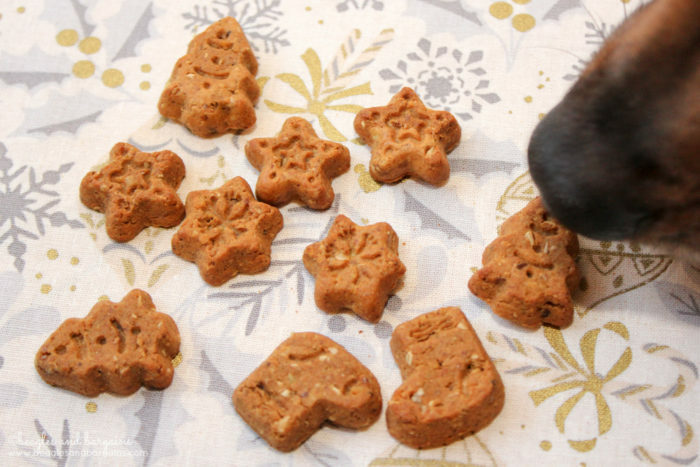 Though they can’t eat the cookies meant for us humans (avoid chocolate, nutmeg, and lots of sugar), you can make them special dog treats! 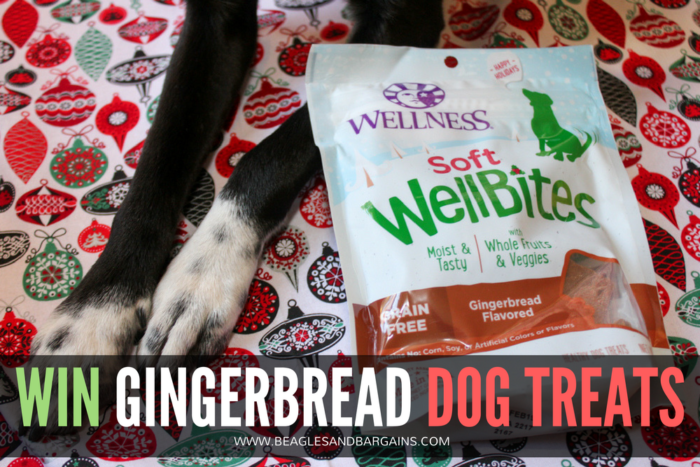 And if baking isn’t your thing, just head to your local pet store to pick up a bag of festive Gingerbread treats from Wellness. My family also has very specific traditions when it comes to unwrapping presents. We all go around in a circle and each person opens one present at a time. Once you are out of presents to open, you just sit back and watch everyone else (usually the kids outlast the adults!) With an extended family of 15 people, this takes a good portion of the day. But I LOVE it because you get to see what everyone else gets and you get to witness the reactions of people opening gifts you gave. Since there are so many people, there is also a lot of wrapping paper thrown about the room at the end. I may or may not jump into it with the dogs like it is a pile of leaves. I also find it so fun when my dogs want to help unwrap. They don’t ALWAYS want to help. It’s usually only when you don’t want them too. They grab a hold of the paper and rip! You usually have to finish for them or maybe even help get them started, but it’s fun to watch. PRO TIP: Don’t leave presents under the tree your dog might be interested in. Or at all if you have a heavy chewer. 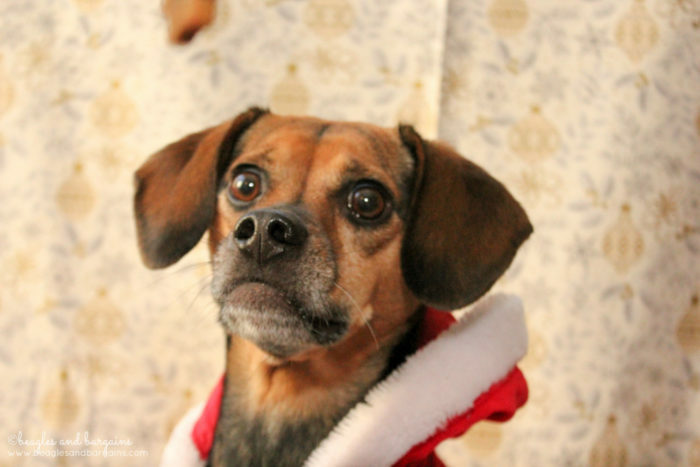 You probably don’t want your dog to eat Christmas! Another tradition is to all get matching PJs and to take pictures for our holiday card. This year we ordered fun Moose PJs from Lazy One. We haven’t taken our picture yet because I’m running so behind this year, but I can’t wait to wear our ridiculously cute matching pajamas together. Not a PJ person? (WHO ARE YOU?) Matching sweaters are also a thing. I love seeing all of the different holiday light displays – both professional and personal. We’re actually headed to a display at our local Botanic Garden tonight! But lately, I’ve been loving just walking around my apartment complex looking at all the balcony light displays with Ralph & Luna. If you live in a community, I’m sure there will be some up near you too! If not, hop in the car and find some. There’s nothing better than enjoying beautiful Christmas lights with those you love, especially if it ends with a hot chocolate and pet friendly PSL. 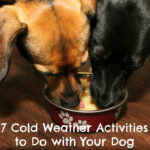 For more ideas on activities you can do with your dog over the holidays, visit our list of 7 Cold Weather Activities to Do with Your Dog. Both of these treats are made only with premium, all natural ingredients, are gluten free, and of course feature a Gingerbread flavor. That means no corn, soy, wheat, artificial colors or flavors! The Crunchy WellBars are just that, crunchy! These treats are oven baked into four different fun holiday shapes – stocking, tree, star, and snowflake. The Soft WellBites are moist treats with chicken as the primary ingredient. 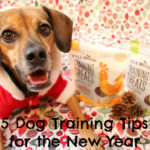 Though these treats aren’t available in the fun shapes, they pack a ton of flavor that my dogs love. Right now you can get both treats at PetSmart (in store or online). The Wellness Gingerbread Soft WellBites are $4.97 for a 6 oz bag and the Wellness Gingerbread Crunchy WellBars are ONLY $2.47 for a 8 oz bag. NOW that is a Christmas bargain if I have ever seen one. My two dogs thoroughly enjoy these treats, so I bet yours will too. If you want to learn more about Wellness, be sure to follow them on Facebook, Twitter, and Instagram! Don’t forget to check out the Wellness website too. 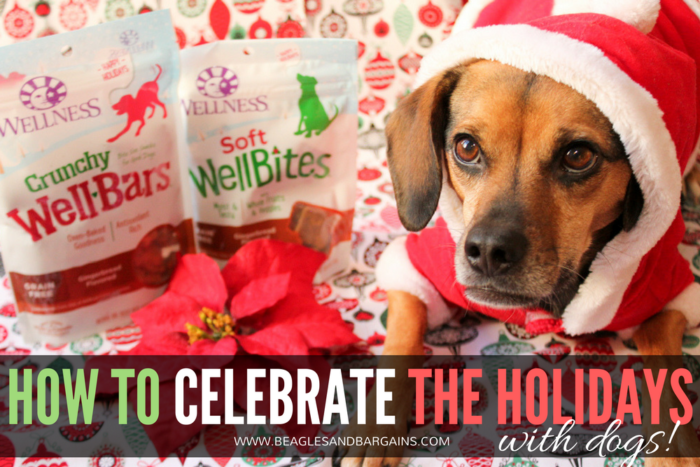 FIVE lucky Beagles & Bargains readers will receive a Wellness Gingerbread Crunchy WellBars and Gingerbread Soft WellBites! Five (5) winner will receive two (2) bags of Wellness Gingerbread Crunchy WellBars and two (2) bags of Wellness Gingerbread Soft WellBites. Estimated value is $25. What is your favorite way to spend the holidays with your dog? Disclaimer: Wellness provided product free to review. I am being compensated to help spread the word about Wellness. I received no other compensation or additional benefits for mentioning the brands or products in this post. The opinions and ideas in this post are my own and are uninfluenced by any other person or business. Wellness is responsible for all giveaway prizes including shipping.